If you follow my newsletter, perhaps you know that I’ve started working at Wanderlust Hollywood as their chef/culinary director. I started working here in October and have been loving the vibe, the yoga and all the healthy food! Wanderlust is a diverse wellness company that focuses on yoga with festivals, yoga centers, events and online yoga resources. The lovely center in Hollywood has a cafe inside that caters to the daily yoga clients, neighborhood residents and regular event catering. The philosophy of Wanderlust is “Find your true North,” which they describe as cultivating your best self! 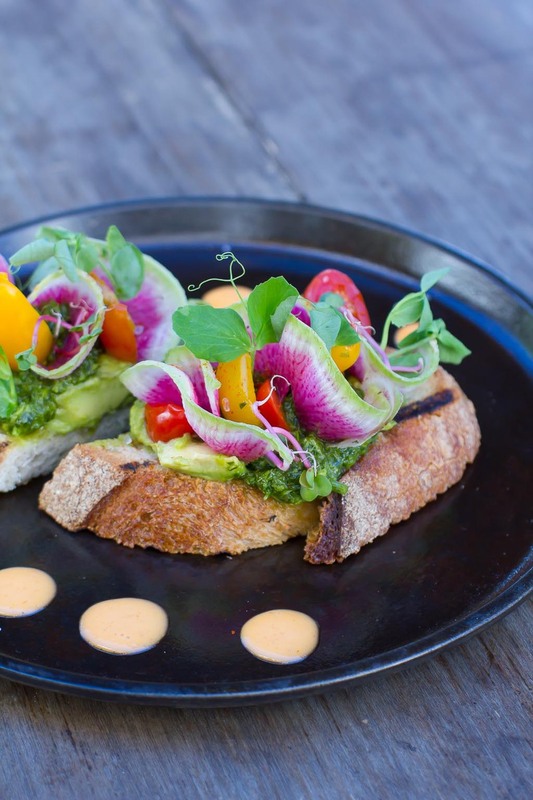 The cafe is not vegan, but is dedicated to a wide array of healthy whole food choices, with lots and lots of plant based options – a focus is on seasonal, whole food ingredients, real food, which I whole-heartedly agree with! 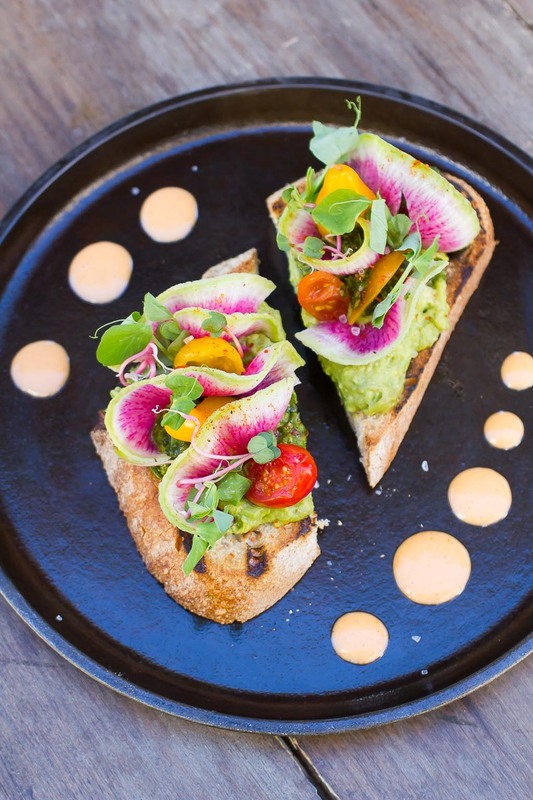 The most popular dish on the menu is our Radish and Tomato Avocado Toast! 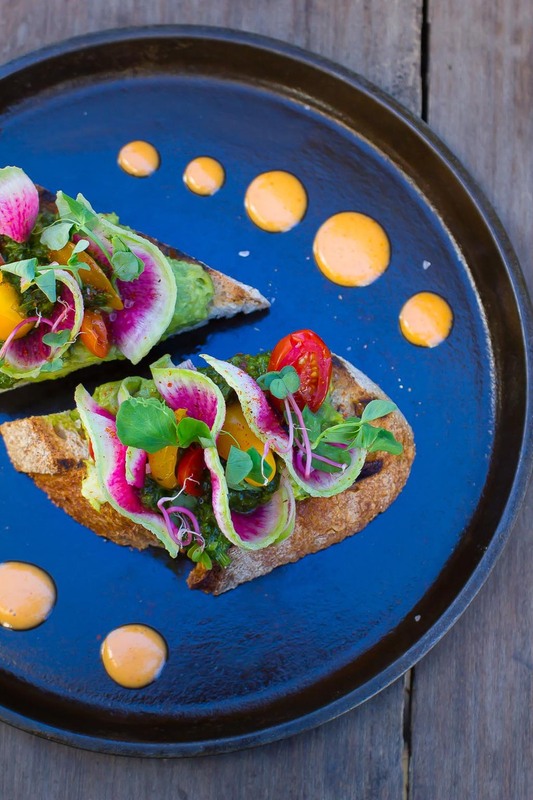 There is something about avocado toast that hits the spot….well, anytime! It’s such a pretty, easy and versatile dish to make. Some of my favorite toppings to put on avocado toast will create a contract in texture-something crunchy is always in order, like the watermelon radish here! You can also top it with crisp carrots, apple, or shaved Brussels sprouts. Try adding something rich like squash or tomato. Finally, I like to add a sauce for flavor, like the chimichurri here, or perhaps some pico de gallo, sriracha or balsamic! Here is a vegan flatbread pizza recipe you might enjoy! Measure all ingredients and add to a blender. Pulse the blender on low until the ingredients for a chunky sauce. Mix the avocado, lemon juice and salt. Smash with a fork until a chunky consistency. Thinly slice the watermelon radish. Lightly the sourdough bread with oil and toast. Spread some of the smashed avocado onto the bread. Top with a spoonful of the chimichurri, tomato, watermelon radish slices, radish sprouts, and pea shoots. as that would be a whole cup…? could you clarify that…? thanks. k.
bunches cilantro (it’s lighter in weight than the parsley). Thank you. k.
Thank you for the reply! I appreciate your feedback. It is a lot of garlic! !